If you use email to connect with, engage with and sell to your audience, you’ll want to lean into this article because email is about to get a whole lot more interesting. Let me ask you this – have you heard about ?video email marketing? ? You know what marketing is, you know what email marketing is, you even know what video marketing is — but video email marketing? ?Yeah, it’s probably what you think it is; an email with a video that you can watch right inside of it. Video email marketing isn’t a new concept, I was first introduced to the idea sometime around 2003. It sounded interesting, but to be honest, I prefer to READ my emails because I’m usually checking them at times where hearing any kind of audio would be extremely embarrassing. But, I digress. The bottom line is that video is on an upward trajectory no matter how you feel about it. the email video marketing trend was way ahead of its time. YouTube, Twitter, Facebook, LinkedIn — all of these brands were just glimmers of ideas at the time. If you had a cell phone, it was most likely a flip phone. At that time, if you were selling online, you were most likely using email. But lately, email marketing has become a real challenge. Social media has taken a huge chunk of the engagement away from email and platforms like YouTube, Facebook, Twitter, LinkedIn and Blab have even hijacked the ever-popular webinar marketing model. Small business owners, coaches and consultants who have traditionally enjoyed double digit engagements have been feeling the pinch of email marketing overwhelm and social media distraction. 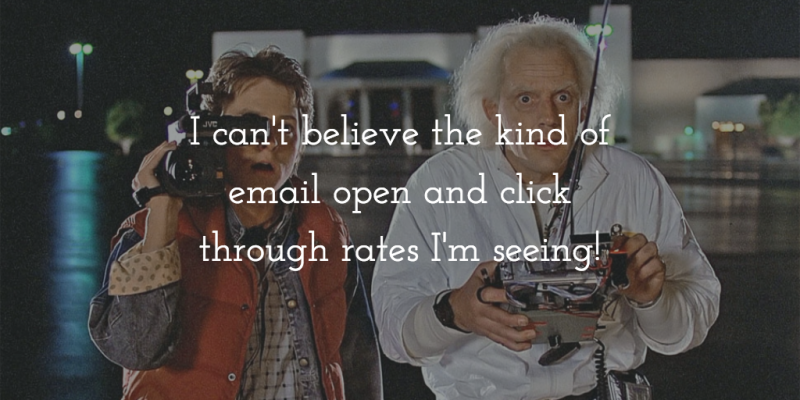 THIS is what I’m talking about — if your email click through rate is sitting at a paltry 2-5 percent, an increase of 200-300 percent will be like going back to the future in terms of effective email marketing! I’m going to assume that you might be somewhat like me and be a little reticent about using video email marketing. I get it. I felt the same way. So I started doing some research and this is what I found. It’s so easy to get star-struck about new trends, tools and strategies and then forget that none of those will work if you don’t have a good foundation in place. At the risk of being repetitive — I have to go over this list of pre-requisite activities. Consider this your pre-flight training. Understand your audience. This is?always the first step in any marketing strategy. 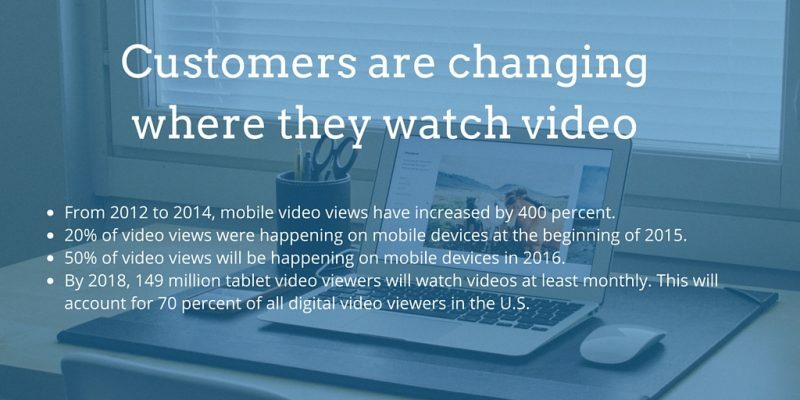 We already know that lots of folks like video, but does?your?audience appreciate it? What kind of video will the appreciate most? Do a thorough audience profile that features the demographics, psychographics and information needs and wants. Be clear about your messaging strategy.? What problem is your audience trying to solve, how do they?think they have to solve the problem and how do you believe they have to solve the problem. Have specific branded talking points outlined as part of your messaging. Create a marketing funnel.? Create a flow chart of the journey your customer take from not knowing anything about you as a solution to their problem to coming back to you over and over again as the provider of the solution. Focus on the specific decision points that they can make and be sure to provide education and information that will help them choose the best solution (hopefully yours). 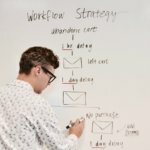 Here’s a very practical explanation of what a structured email marketing funnel can do. It comes from the folks at Digital Marketer. Assuming you have your marketing and email strategy pre-requisites taken care of, I want to get into the section you’ve been waiting for — the email video marketing tools that will help you get those 200-300 percent increased open rates happening for your business. The first thing you need to do is decide on what email platform you’re going to use. The choices are overwhelming so I’m going to simplify things for you. Basic email (Gmail, Outlook, Mac Mail, Yahoo, etc.) ?This is as basic as it gets. It’s whatever email platform you use for your business email. 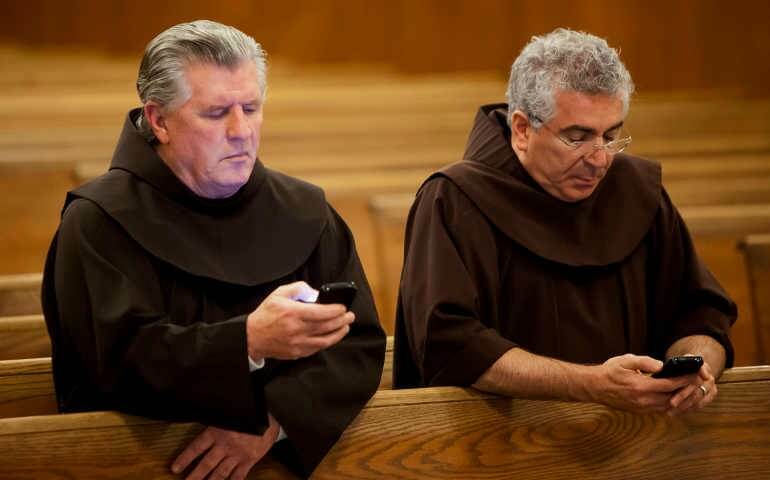 Traditionally it doesn’t have a lot of automation and it also has some limitations to sending group messages. This is where 99% of your customers live. This is the goal, to end up in this inbox. Email marketing platforms (aWeber, MailChimp, Constant Contact, Infusionsoft, etc) If you are collecting emails from forms and sending newsletters or automated email campaigns, you’ve probably already signed up for one of these services (or one of the dozens out there that I haven’t mentioned). I could make this more complicated, but I won’t. The bottom line is, you and your customers have the email you live in and then you have an email platform that you market in. 1. Within your email, include an image from your video and put a play button over top of it to mimic the look of a typical video player: Here you’re adding a visual indication that a video is part of your email with the play button. 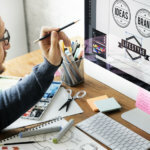 When readers are prompted with this play button, they’ll click the image and be directed to a landing page or a branded video sharing page with your video embedded. Using a compelling image to link readers to your video content within email works really well to increase click through rates. 2. Embed video on your landing page and set it to auto-play: Because you’re technically redirecting folks to a landing page with your video embedded, you’ll want to catch their attention right away and auto-play is a surefire way to do this (it also requires less clicks from your viewers). 3.Place a call to action during, or at the end of the video that suggests a clear next step for your audience: If you’ve managed to get your readers to become viewers, you’ll definitely want to direct your them to more content they might like, encourage them to share the video with social buttons, or have them fill out a form at the end of the video. Wouldn’t it be great if you could COMBINE your email marketing platform with a video solution? You knew where this was going – didn’t you? 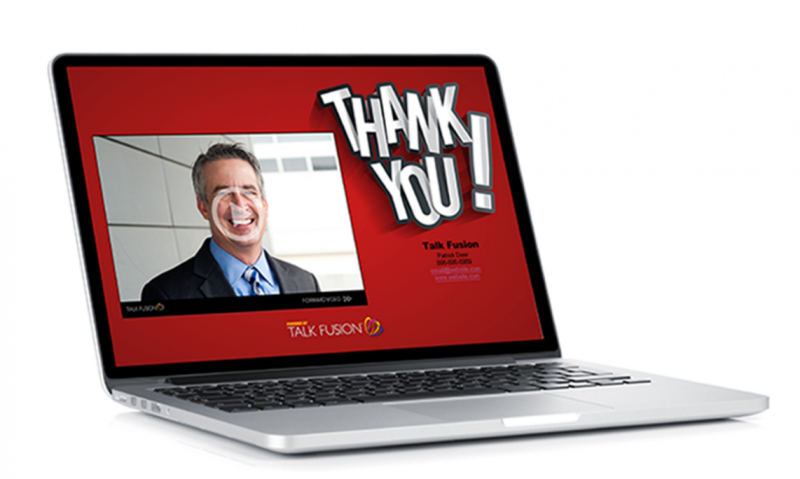 I was recently contacted by Talk Fusion to write an article about?their video email platform. As I mentioned before, I had heard of these before and had tried using them myself. But this was before the video trend really took off and I just wasn’t interested. But today, I think my response would be a little different. While I’m not an avid video user myself, I know lots of you are awesome on video and would appreciate a review on a tool like this. I’m going to do something a little different — I’m going to reverse the traditional “product review” sequence and focus on the ideal person or business for Talk Fusion. 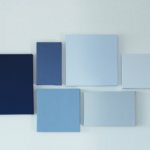 You aren’t “techy”: If you’re one of those people who just wants to focus on running your business and not on how to tie together different tools and technologies to make it all work. If your audience, prospects or customers aren’t “techy”: If you’re selling or connecting to people who just want to open an email and see or hear a message without changing settings on their email. If you are already spending money on an email marketing platform AND want to use video. If you’re sending thank you emails and newsletters, offering training or demonstrations to customers, prospects or team members. If you close most of your sales in face-to-face meetings. If you’re the kind of person who really connects to folks face-to-face, this is a wonderful way to bridge the distance gap and make you more efficient in closing deals. If your product or service shines with demonstrations and testimonials. I can imagine my hairstylist using this to show off cool, new cuts and looks and build her customer community. I can imagine a restaurant sending out an email with a video of today’s specials shot from the kitchen and featuring the chef. I can imagine my financial planner recording a quick video email to tell me about a great new investment opportunity. If you’re a coach or consultant that has been doing training video but sending emails that link to videos. 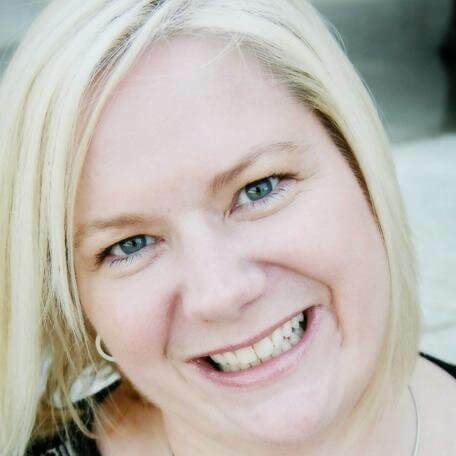 This will be a super easy way to connect with prospects and clients without investing thousands of dollars in technology you aren’t using. If you said yes to any of the 7 descriptions above I believe you’ll want to at least check out Talk Fusion to see how it can help you grow your customer relationships and increase your business. By far, this is the feature I think you will appreciate the most. The simple ability to?send a video email or a newsletter without having an advanced degree in IT. The system not only gives you the ability to record a quick video email on the spot, it also allows you to upload any kind of video file. So that you can actually repurpose any video training or demonstrations that you’ve done in the past. Talk Fusion creates a simple landing page with a call to action button too. The thing that stood out for me was the email marketing feature and the ability to create email lists, autoresponders and registration forms that are connected to the video email. This means that you only need this one platform to gather registrations via email forms, send emails and newsletters and see reports on who opened your email. Another great feature is the ability to have live meetings with Talk Fusion. This is ideal if you are managing a virtual team or if you are running regular coaching sessions with clients. This is a HUGE time and money saver. Talk Fusion gives you the ability to create, upload and store presentations inside the platform. So that you can have everything in one place. Another cool integrated feature is “Live Chat”. At first, you might?think that this feature is eclipsed by services like Google Hangouts, Blab, Facebook LIVE or Periscope, but I would say — not really. Remember, Talk Fusion is primarily a platform for small businesses and small business owners who are NOT super social media or tech savvy and who want an easy (and even private) way to connect with their customers for sales meetings or presentations. The Live Chat feature gives you that level of confidentiality and privacy that you may not get so easily with some of these other platforms. It’s not rare to give potential new customers a 30-day free trial, but it is rate to get a free trial without adding your credit card information — and personally, I like that a lot because it’s not unusual for me to try something and then forget that I’ve tried it and then get billed a couple of hundred bucks. UUUGH. You won’t get any of that here. Just go to TalkFusion.com, and click on the “Try it Free” button. As I was researching the history of this product, I noticed that the pricing structure has changed quite a bit and it seems more affordable than EVER to give this a try. 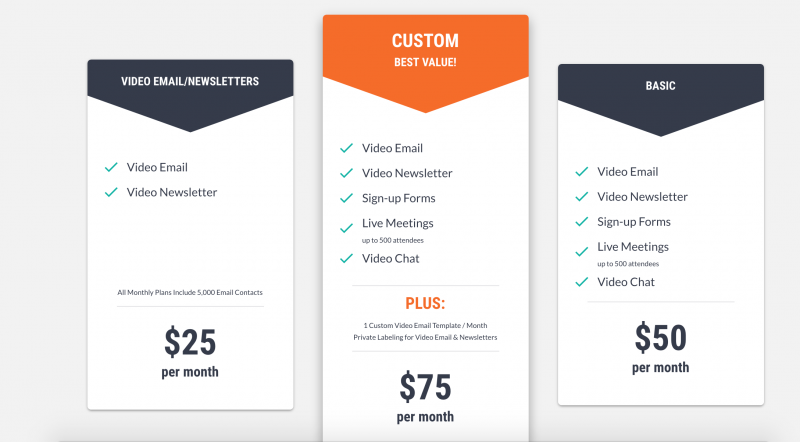 The starting package is just $25 per month for video email and newsletters and I think this is a great introductory price point. 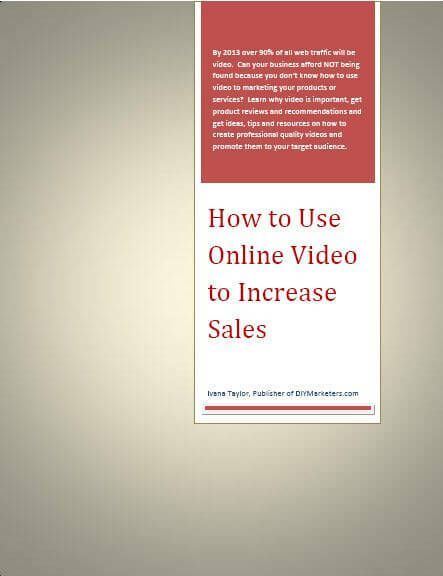 Yes, I know there are email marketing platforms that are FREE – but they don’t really make it easy to include video AND — remember having video in your email increases open rates like crazy. One thing I’d like to draw your attention to is that the price tops out at $75 per month. So if you’ve got a large email list (up to 5,000) and you’re primarily sending newsletters and emails to several different kinds of lists — this is a steal because you can consolidate your email marketing service and your online meeting platforms into this one-stop marketing system. If you’ve been on the fence about trying video as part of your marketing strategy, Talk Fusion is making it easy to give it a shot. 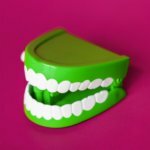 I’d recommend taking on the tips in this article, and running a simple 30 day campaign to see if it pays off for you – I’m willing to bet you’ll be pleasantly surprised. Marketing With Video: Are You Missing Out on The Best Pull Marketing Tool EVER?